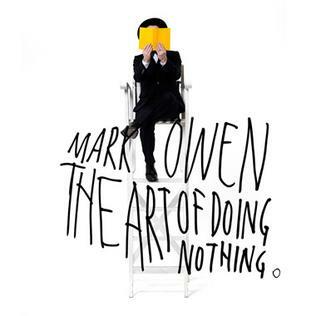 Out yesterday, The Art of Doing Nothing (Polydor), is Mark Owen’s fourth solo release and his first since 2005’s How The Mighty Fall and it deserves success. Mark is not looking to Robbie everyone’s socks off, he’s in a band more than capable of doing that – no, this new material find him seemingly at ease and going in new sound directions because it felt right to him. The lyrics go from personal to universal and its clear this is what he wants to say right now. Giveaway – starts like a bit of a dirge, church organy and vocal. I could listen to Mark delivering vocals like this all day long, just his voice before the shiny synthy stuff gets added. This track has a good groove to it when it gets going; it’s a bit of an odd one to open the album with because there are stronger tunes to come. I will say this though, when he sings “when you fall, you’ve got to give it all away”, he knows what he is talking about and maybe the message is what puts it first. The One – this is upbeat and it builds and you know it’s going to explode. The opening vocal is lovely especially when he stretches to sing “life… “ I don’t want him to stop, this one is the first hands in the air moment because the song goes somewhere else with the “Evertime I close my eyes…”, it’s a bit Coldplay and the drums keep it moving. Lyrically it doesn’t let the song down; it’s simply a big tune about love. Awww. Stars – the first single, a synthy melodic extravaganza, it’s catchy and is perfect for making people sit up and take notice. You might not be on board for the airy wispy, “Gonna build a rocket” opening but you’ll get there by the time the drums kick in. Carnival is musically, a bit plinky plonky (technical term), lyrically it’s better, it’s about living life and keeping the drum and the carnival within yourself and living life ‘together’. Very inclusive, very positive, it out postives Travis in fact. This was the first one that passed me by a little, the next track Animals , might have done as well but the “shout it out, we could be the animals” chorus has enough to pull you in even if it doesn’t grab you initially. Us and Ours is a quirky poppy train, the fast drum beat was very Chain Reaction to me – you took a mystery and made me want it… but then I was back in the present and lyrically this song is good enough to get you through the smiley happy tune if that’s not your bag. “Don’t, don’t count your blessings, too much, you make them less”. Good lyrics to a hyper, happier than cbeebies, four minutes. I don’t know for sure but I suspect that everyone that is onboard for the Us and Ours bouncathon, is left behind for Heaven’s Falling. Honestly, I see it as a strong point for the album but many may not – it’s moody, maybe a bit gospelly, deep and dark. The rap bit features Jake Emlyn and his part isn’t out of place at all, the song seems to be about appearance and reality and people. Raven is Coldplay-esque, the melody chimes and it’s as fast and bouncy as Us and Ours but it’s not sickly because of it, this time it works. Yes it’s about love but it will still grab you. It’s got jangly acoustic guitars and echoey electronicy twinkles too, all carried by pounding drums (think Fix You, tears streamin…). ‘Every idea has a starting place, nothing begins in an empty space’. S.A.D. (featuring Ren Harvieu) floats by, the guest vocals are beautiful and the standard album ends with The End of Everything which is a stomp, a big chimey, chordy, stomp and a great ending. Mark belts this one out. Deluxe edition – Ghosts fits with the musical tone of this album, it’s got driving drums, strings and a good melody. The lyric is more first person, dealing about loss. It would not be out of place on the album. Morning Belle is a bit of a slog and The Lamb is simple and beautiful. It starts with whistling that’s a bit reminiscent of Five Years Time by Noah and the Whale. This is the kind of thing my soul wanted yesterday when I was all about production burying Mark’s voice, here it doesn’t. Beautiful. On first listen I thought that some of the songs were good lyrically and deserved a different presentation. I thought that at times the layers of production were too thick and distorted what was underneath incredibly good. I changed my mind, it all fits together, even if some tracks may pass by, over all, song by song it’s a strong piece of work. Initially, I had nothing to go off outside of Mark’s Take That outings and the solo songs I think stand up, Clementine and Four Minute Warning, if you care. From that expectation, yes this album is a departure but rid yourselves of that idea because this is the album Mark wanted to give us, not to stand out or be noticed, just because that’s what happens when you can go anywhere. The Art of Doing Nothing stands up to repeated listening; parts grab you on first listen, but really cling to you the second time round and it deserves the time. If you don’t find anything to like about this album then I guess you are going to forever see Mark Owen as the cheeky smiley one who sings a few of Take That’s songs every now and again. He’s given you evidence to suggest there is more and it’s stronger collectively than perhaps some of his other releases have been. The Art of Doing Nothing shows that Mark has most definitely been doing something and it deserves to be more than something to put people on ‘til the next Take That album. Mark has delivered the strongest solo collection of his career.